Simon Says Thinking of You! I used three dies from Memory Box to make a layered shaker card for the challenge. I used Distress Oxide inks Cracked Pistachio, Salty Ocean, Distress Ink Blueprint Sketch and Color Shine Spritz Navy and gold to create four background panels using watercolor cardstock. I created one more watercolor background panel using Color Shine Spritz Coral. Then I used the second die from Hero Arts Infinity rectangle die to die cut them all out. 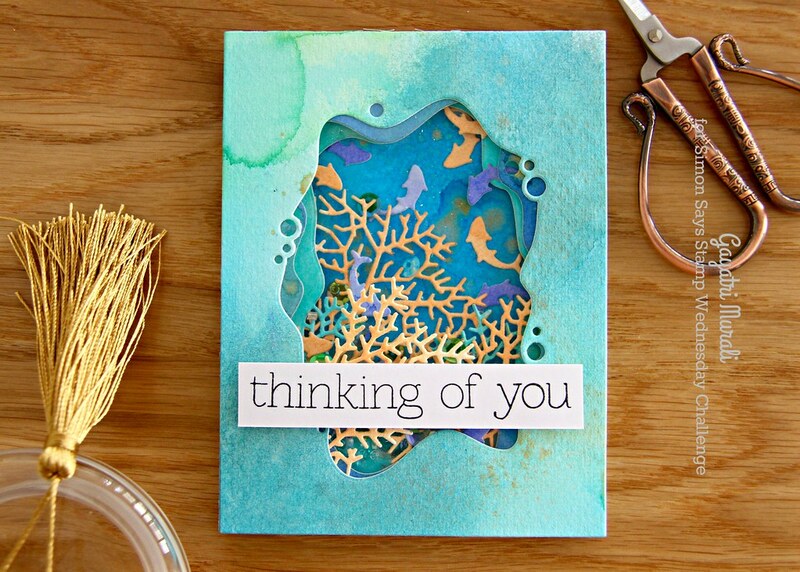 Then I die cut the three blue backgrounds using Memory Box Delicate Sea Fern, Goldfish Collage and Underwater Collage dies. 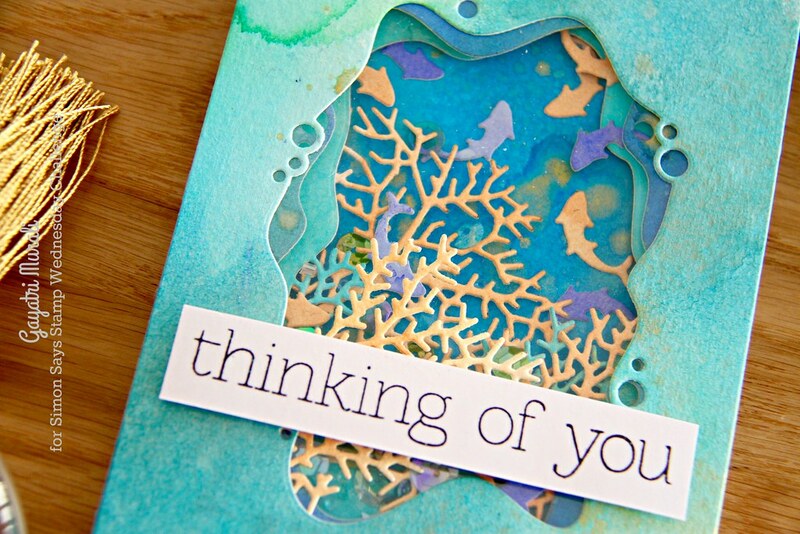 And the Coral background panel using Coral Collage die. I then glued the coral on the three die cut panels. I adhered two die cut panels over the background panel using foam adhesives. Then glued the fishes inside on the background panel and some half on layering panels and rest hanging out inside. Hope I make sense. I also added some beads and sequins inside. On the last die cut panel, I adhered acetate sheet behind and flush glued this panel on top of the layers to make shaker element. For the sentiment, I just black heat embossed the sentiment from an older Simon Says Stamp called Friendly Flowers. I really love the layers and the interesting colours on the layers. Here is the photo to pin into your Pinterest Board. 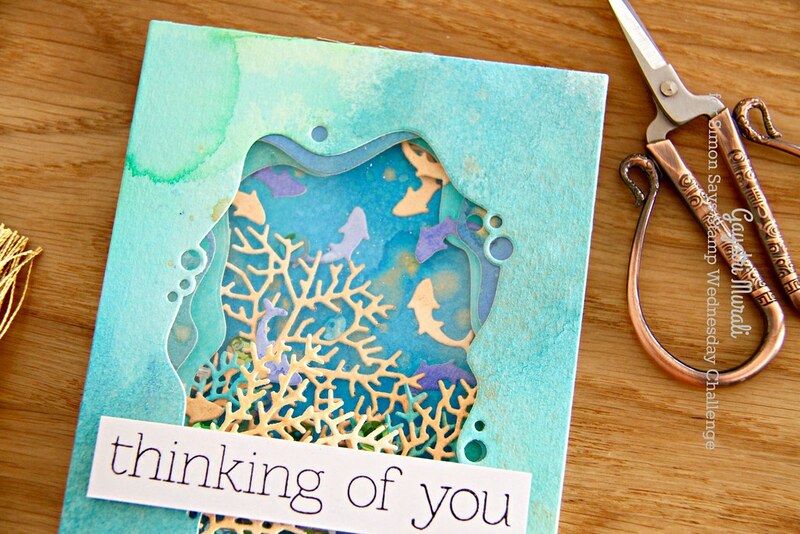 What beautiful layering and coloring you’ve achieved on this card. It is just gorgeous! WOW! This multi-colored layered coral is beyond gorgeous, Gayatri!! Stunning design! Love the window! Love all the layers, Gayatri, and the wonderful soft colors!